Reigning MotoGP world champion Valentino Rossi will decide later on today whether he will make a dramatic return to racing this weekend at the Sachsenring. The 31-year-old will test James Toseland’s factory R1 World Superbike machine at the Brno circuit in the Czech Republic to assess his fitness ahead of a shock return to action in this weekend’s German MotoGP clash. Rossi only broke his right leg during practice for his home race in Mugello less than six weeks ago. But his recovery has been so rapid that he’s contemplating a return well ahead of schedule. His initial comeback date was the Brno MotoGP race on August 15, but Rossi wants to return for this weekend’s Sachsenring clash, round eight of the 2010 MotoGP world championship. Rossi tested an R1 World Superbike machine at the Misano circuit close to his Tavullia home last week, just 32 days after he suffered a compound fracture of his right tibia bone. And he will back on board an R1 in Brno today before making a decision on whether he’s fit enough to return. A short statement from the Fiat Yamaha Team said: “Following his first test ride at Misano last week, Valentino Rossi will test again in Brno today. 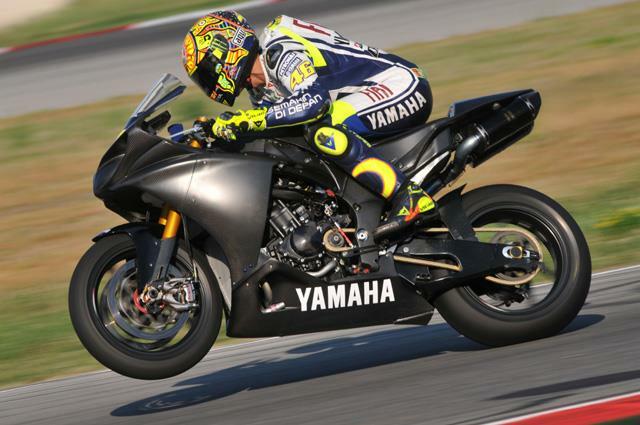 "He will again ride a YZF-R1, provided by the Yamaha WSB Team to the Fiat Yamaha Team. After this test Rossi will decide whether or not he will ride at the German Grand Prix this weekend.